No doubt, you have noticed those ads running on the front page for Maals, and you’re wondering, well, what is this brand (and watch)? Rest assured, we’re only showing you stuff (in terms of advertising) that we think is interesting. For this particular round, the ad world bled into the editorial (though we do maintain strict firewalls between those teams), as we learned that there was a prototype we could be loaned. So, why not? Let’s poke around and see what you’ll get should you pre-order your own Maals Jump Over The Moon. Now, first off, that name. Looking at the dial, of course, you see nothing that would indicate anything of space, or the moon – at least if you’re me. I originally though it got it’s name from the caseback. As it turns out, no, that’s not the case. It’s actually the case of a “Jump Hour” indication being over the moon phase. Hence, Jump over the Moon. Then, on the back, the theme continues with an engraving based on art by Okse. You’ve got a stylized astronaut bounding over the lunar surface, and in the background, you can see a UFO beaming something onto Earth. The engraving itself is decently deep, so it should stay there a good long time, without being too much of a magnet for wrist crud. Now, back over to the dial side of the Maals Jump Over The Moon. This is what grabs most peoples’ attention, I’m presuming, as it is quite different. Showing it to friends at work, they quickly called out it’s similarity to a dashboard gauge, and with the triangular cutout, I can’t argue. Then the real exclamations started once they realized that the large hand was the running seconds. How do you tell the time? The triangle is the key. You see, in that triangular cutout in the dial of the Maals Jump Over The Moon, you’ve got three discs busy at work. At the bottom, you of course have the moon phase indication. Above that, you have the hours disc, and then above that, you have the minutes. A simple choice (in some regards) and we have seen disc-based timekeeping before. The interest here, of course, is how it’s all built up and presented. I was curious at just how easy it would be to tell the time. I quickly had my answer when I set it upon receiving the watch in. 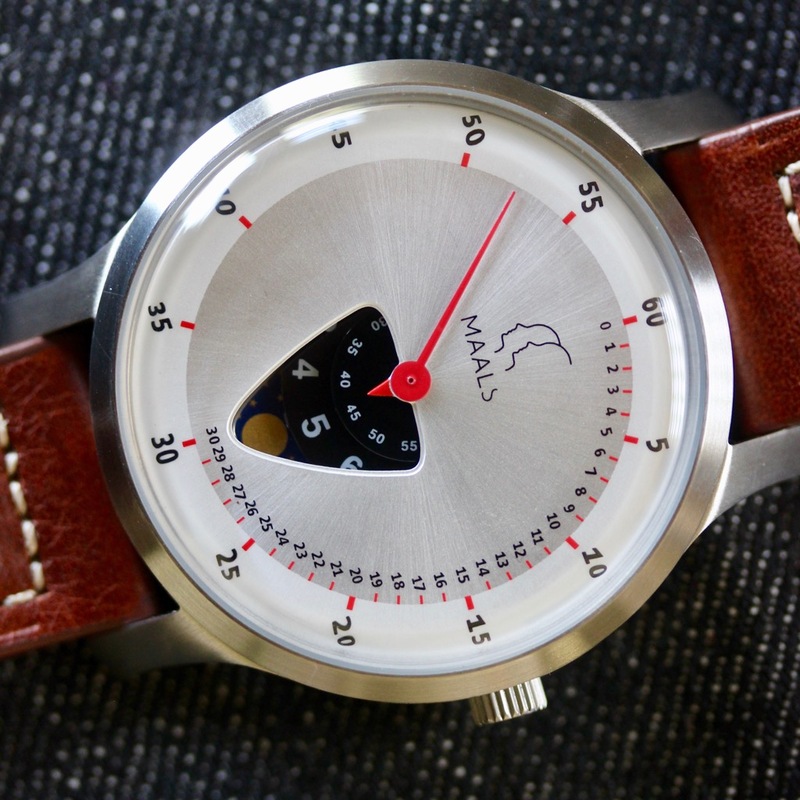 As the Maals Jump Over The Moon stands (in this prototype), it’s difficult for my eyes to pick it out. The minutes are just too small (though the photos pick it up nicely enough). When I spoke to the brand about this, they did say they were making changes for the production version. On the minutes disc, the 5’s will be large dots, and the 10s are 50% larger, so that should help. They’ve also increased the size of the numerals on the hour disc to keep things proportional. With those changes, it addressed the major concern I had with the Maals Jump Over The Moon. Sure, it still may not be the most “at a glance” capable watch, but it is workable. And, with this sort of layout, you’re starting down the road that most single-hand watches travel – that of a more relaxed relationship with reading the time. I personally prefer knowing the minute accuracy (and quickly), but others like the calmer path of time telling. All the more power to them. Would I wear it? At the end of the day, no – it’s not for me. What I’d change: I’d swap the seconds to disc, and move the minutes to the large hand. The best thing about it: It’s a unique look unlike anything I’ve seen as of late.